Why perform a Data Warehouse Certification? 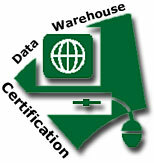 What is a Data Warehouse Certification? What good is a data warehouse if the data is no good? The quality and transfer of data must be accurate and complete - or else you jeopardize user acceptance. Once the data warehouse data is perceived as unreliable, it is next-to-impossible to reverse this opinion. Users simply stop using the data warehouse. Your investment becomes virtually worthless. To ensure against this, take the extra time and effort to certify the data warehouse upfront. What is an Oak Enterprises' Data Warehouse Certification? The Oak Enterprises' Data Warehouse Certification process verifies that the data warehouse is capturing the correct information and that the resulting output is accurate and complete. Done before the data warehouse is actually implemented, certification is a critical step involving analysis of both the data and the processes that extract the data from the various sources throughout the organization. Oak Enterprises' Data Warehouse Certification also confirms that both the initial "baseline" data and all subsequent refreshes (imports) of the data are correct. The end result is a data warehouse that is accurate, complete and stable. User acceptance is assured, as is your return on investment (ROI). Analyzing the content of the populated data warehouse for accuracy and comprehensiveness. At least two test cycles are conducted - one after the initial conversion of historical data and a second after a subsequent refresh. Verifying the reliability of the processes that extract, transform and load the data warehouse from its data sources. Examining the quality of the data being moved into the data warehouse. The end result is a quality data warehouse with high user acceptance - plus the elimination of costly rework after the data warehouse has moved into production. For more information or to get a quote on data warehousing certification for your company, call John Oetking at (630) 545-4889, or contact us on-line.